A very warm welcome awaits you at Forest Cottage Bed and Breakfast which comprises two separate independent cottages, Mulberry Cottage and The Hawthorns. 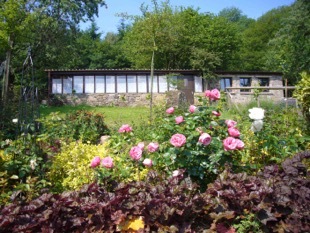 They are set within our extensive flower gardens situated on our organic smallholding in Tintern Forest. Beautiful forest and river valley, and heathland walks are right on our doorstep. The B&B is located within a mile of Tintern Village with all its many attractions including the Abbey, Tintern Old Railway Station and many old pubs serving good food. Mulberry Cottage sleeps two and is a spacious, light and airy twin bedded room with an en-suite shower and toilet and a separate dining and kitchen area. 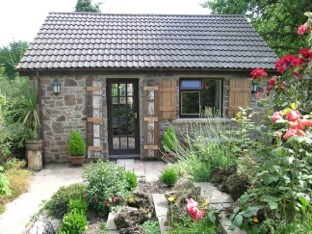 The accommodation is situated in a pretty, stone-built detached cottage and has its own outside private patio. The Hawthorns sleeps four and has two separate twin-bedded rooms, a shower with toilet facilities, a large light and airy living room incorporating a kitchen/dining area. A sunny garden room runs along the length of the building. It has its own private patio. Both cottages are surrounded by flower gardens and orchards. They come equipped with TV and DVD players. The kitchen in each cottage has a hob-top, microwave, fridge, toaster and electric kettle. Tea, coffee, milk, sugar and biscuits are supplied for you on arrival.